Clarizen is a leading collaborative work management solution for enterprises. Businesses can address challenges far beyond traditional work, project or resource management using this solution. With Clarizen’s enterprise-grade solution, teams are empowered to streamline work, automate processes and gain greater effectiveness across the entire work lifecycle, from strategic initiatives to team execution. Clarizen’s work management approach serves to connect the entire planning and execution lifecycle—from how executives kick off business initiatives, how organizations create plans to support company goals, and how employees collaborate together to realize those objectives. When organizations connect and holistically align their enterprise in this manner, it allows stakeholders to make more informed decisions and proactively meet customer expectations. Clarizen creates a line of sight across the enterprise so teams can share goals, increase accountability and drive greater focus. It also increases effectiveness in supporting different work methods to accelerate execution at the team level while also offering portfolio level progress across the enterprise. Finally, it lets teams respond immediately and collaborate with real-time information, highlighting potential issues faster so can the business can take action faster for more positive outcomes. A customizable and friendly interface. Teams enjoy interacting with Clarizen’s engaging social interface, one that is easy to configure and personalize, meaning workdays become more efficient and effective. You get the transparency you need to drive productivity and profitability to boost your business growth. Project managers get a solution they need to ensure all tasks come in on time and on budget. Effective and Result-Orientated Collaboration. Clarizen is a leader when it comes to enterprise-class work collaboration and project management needs that tap the power of the cloud to finish work effectively, efficiently, and with better results. Its enterprise collaboration features connect social context with tasks and projects to result in increased productivity and profitability. End-to-End Project Dashboards. Clarizen’s collaborative work management brings all of your work together in one convenient place: your planned and unplanned activities, your collaboration with peers and partners, your documents and reports, and your unique workflows, from start to finish. The unique combination of cross-organizational project management, flexible workflow automation and purposeful collaboration in Clarizen’s enterprise-grade platform unites teams, reduces unnecessary communication, and provides extensive visibility at all levels of the organization, so everyone can work more efficiently, adapt to changes, achieve their objectives and deliver results. Mobile Optimization. The newest version of the program features an advanced list of mobile and conditional formatting options, as well as improved data-analysis updates users are not supposed to pay for. There is also a variety of new profitability reports that add value to the already outstanding list of PM benefits. Easy Administration. To start with, doing administrative work with Clarizen is very easy, the reason being its notably clean interface. All modules are displayed on a single navigation bar, and the user is able to choose between 6 different views, and a variety of project templates. The ability to add notes and to search for those is another powerful feature, being more than handy when importing data from Microsoft Projects. Simplicity is the exact rationale behind the program’s rapid project management, and the accomplishable-in-minutes implementation that doesn’t require training and preparation. Easily Accessible Information. Needless to say, Clarizen has mastered what every online management tool should do in the long run: it has demolished time and geographical limitations by making corporate information accessible ‘on the go’, and it performs the role of an unbreakable chain that keeps even most diverse and distributed teams connected. Unlike most project managers, Clarizen doesn’t require expanded lists of standards and rules – its secret is that its allowances are categorized in multiple licenses, meaning that there is little chance for your team to be overwhelmed by expensive features they don’t actually need. Flexible Business Operations. The above mentioned flexibility refers to updates as well, meaning that all new versions and integrations will be automatically upgraded in the system, and you won’t have to put projects on hold just because your online project manager provider released a new version. Besides, we all know how irresponsible we can be when it comes to missing integration, and how threatening this can be for the security of our data. Having someone to think about it instead of us (and to remove this burden from our IT team’s shoulders) is simply priceless. Out-of-the-Box Project Planning. Clarizen offers advanced project planning, as its toolkit contains both traditional PM methodologies (due dates, deliverables, milestones, resources, independencies, etc. ), and out-of-the-box possibilities such as using generic resources in the planning phase, or sorting them out based on their availability. Overall, creating a project from scratch happens to be easier than altering an existing one. Fast and Measurable ROI. From the prioritization aspect, you get to analyze and compare projects based on ROI, resource availability, workloads and budget. Clarizen automates all process related to managing requests and demands, which makes it easy to handle multiple projects at once, and to make sure that each of their pipelines will be properly aligned to the long-term goals of the company. A specific methodology that has to be mentioned is the ‘What-if’ analysis, which reveals the potential outcome of every change or business decision. Powerful Monitoring. Then, Clarizen’s presence is notably strong in phases such as execution and monitoring. The tool can help you discover stepping stones and stumbling blocks on time, mostly because it compares information in critical moments, and gives you the chance to generate ad hoc reports on any occurrence that seems somehow suspicious. Accurate Reports. While speaking of reporting, we would like to highlight as well the delivery capacity of the program, being extremely robust with summarizing options (both pre-built and custom reports). The reports can further on be exported to Jira or Excel, but you also count on the strong email integration to share them with colleagues and stockholders. At the end of the process, your products will be archived for further operations. Vendor Support. Being as simple as it is, Clarizen still provides real-time support, and it gives you the opportunity to contact their team of experienced and knowledgeable professionals any time you want. This is an invaluable advantage compared to under-resources and overworked teams that take hours to respond even to the simplest question. The best thing about it is that there are no concurrent costs for technical support – you’ve already covered it with your monthly subscription, regardless of the edition you’re using. Advanced security. Clarizen didn’t stop improving security safeguards ever since it appeared, and makes security available for everyone except on-premise users who personally prefer to manage security issues themselves. Their security servers are hosted in SOC 2, Tier 3, and North American Type II certified facilities, keeping data monitored and archived under multiple firewalls. As expected, the format is encrypted MD-5 hash, meaning that there is no unprotected section in the program, and that access to information depends exclusively on user permissions. What Problems Will Clarizen Solve? Every project, every change request received, and every issue has a client and a revenue stream attached to it. Client satisfaction and an organization’s success and profitability depend on the efficiency of the department. Holistic Work and Project Management – Clarizen offers a holistic approach to project and work management, accommodating the full scope of customer implementations and ongoing maintenance. Rely on robust and fully integrated modules for high-level project planning, collaboration between professional services teams and clients, as well as resource, capacity, budget, expense and timesheet management. Real-Time Visibility into Projects and Your Resource Pool – Clarizen centralizes all data and activities entered by team members and automatically updates the appropriate client project or request, so that at any given moment, you get real-time visibility into a project’s status and progress. Instantly identify and respond to overloaded resources, resolve issues that can affect project due dates or profitability, and monitor margins. 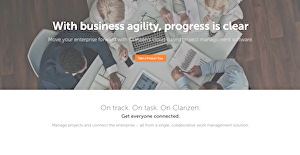 Social Collaboration and Work Execution in a Single Tool – Clarizen merges social collaboration with project management and work execution. It enables “3-D” conversations, where the discussion posts on your project news feed are linked directly to work execution items and specific tasks, action items, approvals, progress reports, expense sheets and more. Full Configurability – Clarizen is designed to work the way end users do, not the other way around. It offers fully configurable dashboards, workflows, business rules and approval processes, as well as custom actions and fields. Since Clarizen doesn’t force users and their colleagues to reinvent the way you work, user adoption rate is high. Total Work Management – Clarizen allows a look across all customer projects to see how resources are assigned, the types of projects they’re engaged in, and whether the right skills are assigned to the right tasks. Use that insight to calculate rate of build-to-burn, and make strategic decisions about prioritization. IT departments face a major dilemma as they have a fixed supply of resources, and a never-ending flow of demand. They have to evaluate, schedule, develop, implement and roll out new systems to automate critical business processes. Plus, they need to provide ongoing maintenance for a host of existing systems and respond to change requests and issues stemming from all points in their company. To top it off, everybody wants his or her projects done NOW. Holistically Manage Your IT Project Portfolio – Clarizen allows a look across the entire project and change request pipeline to see how resources are assigned, the types of projects they’re engaged with, and if the right skills are assigned to the right tasks. Use that insight to schedule projects, control budget and make strategic decisions about prioritization. Gain Real-Time Visibility into Projects – Clarizen centralizes all data and activities entered by IT team members, and automatically updates the appropriate project or request. At any given moment, this IT project management software provides real-time visibility into a project’s status, progress and costs. Instantly identify and respond to overloaded resources, as well as issues that can affect project due dates. Configure the System to Match Your Business Environment – Clarizen’s IT project management software is designed to work the way end users do. It offers fully configurable dashboards, workflows, business rules and approval processes, as well as custom actions and fields. Social Collaboration and Work Execution in a Single Tool – Clarizen merges social communications with work execution. It enables “3-D” conversations, where the discussion posts on project news feed are linked directly to work content (e.g. specific tasks, action items, approvals, progress reports, expense sheets and more). Projects happen for marketing teams and product launches, website refreshes, major events, etc. Marketing teams may not be trained project managers, but they are expected to perform like one. Every day, marketers face the challenge of organizing your work and that of other – colleagues, clients and vendors alike – to get the right tasks done on time and within budget. Merge Social Conversations and Brainstorming with Actual Work – Clarizen supports “3-D” conversations, where the creative brainstorming that occurs on your social news feed is linked directly to getting stuff done (e.g. copy and design drafts, wire frames, client approvals, time sheets and more). Conversations, tasks and projects are united, giving everyone the full context around their activities from a single tool. Gain Real-Time Visibility into Marketing Projects – Clarizen’s marketing workflow tool centralizes all activities and tasks by project, along with the progress teammates are making. That means at any time you can get instant and accurate insight into how your projects are progressing, and whether they’re on track to meet your deadlines and budgets. Create High-Performance Teams – Free team from mundane status meetings and unleash their creative potential. With the real-time updates and visibility that Clarizen provides, teams can spend less time in meetings updating one another, and more time innovating and making decisions. Clarizen transforms marketing groups into agile high-performance teams. Configure the System to Match Your Business Environment – Clarizen’s marketing project management software is designed to help the work the end users do. Each team member can rearrange their dashboards to suit their needs. All throughout the solution, you can find fully configurable workflows, business rules and custom fields, as well as the ability to establish custom actions, such as a company’s client-approval processes. Since each company has particular business needs, it is sensible for them to desist from searching for a one-size-fits-all ideal software system. Needless to say, it would be futile to try to find such a platform even among market-leading software solutions. The intelligent thing to do would be to jot down the various vital factors that need consideration such as required features, finances, skill levels of staff members, company size etc. Then, you should do your homework thoroughly. Read some Clarizen reviews and look into each of the other apps in your shortlist in detail. Such exhaustive research can ensure you reject ill-fitting platforms and zero in on the app that provides all the features you require for business success. Aside from these varied thresholds, both options include the same features in their offerings. The pricing information is only available upon quote request to tailor solutions that fit with your organization’s needs. There are also 4 license types to choose from under categories such as Full, Team Member, Time & Expense, and Social. We realize that when you make a decision to buy Enterprise Project Management Software it’s important not only to see how experts evaluate it in their reviews, but also to find out if the real people and companies that buy it are actually satisfied with the product. That’s why we’ve created our behavior-based Customer Satisfaction Algorithm™ that gathers customer reviews, comments and Clarizen reviews across a wide range of social media sites. The data is then presented in an easy to digest form showing how many people had positive and negative experience with Clarizen. With that information at hand you should be equipped to make an informed buying decision that you won’t regret. An robust, intuitive, and versatile software. A valuable SaaS that's very configurable. Using this for managing projects. A customizable tool for collaborative use. What are Clarizen pricing details? What integrations are available for Clarizen? Clarizen provides numerous out-of-the-box integrations with a multitude of mission-critical systems/processes. The comprehensive list includes Microsoft Project, Excel, Outlook, Lotus Notes, Google Docs, Box.com, JIRA, Intacct, Team System (for engineering), TestStuff, Salesforce.com, iCal, iPhone, Android, Intuit Quickbooks, Browsers (toolbars and apps), and Mulesoft SSO tools (OneLogin, Okta, SiteMinder, ADFS, PingIdentity). Additionally, Clarizen’s open API (supporting both REST and SOAP), and MuleSoft connector can be used to integrate with other ALM tools. The robust API and email engine allows fast integration to fit within and add value to existing enterprise ecosystems. Clarizen’s Apps Marketplace also provides additional apps and integrations for the different segments and use cases, and pre-built project request forms and automatic processes that can be used as Auto-assign task managers. Clarizen says it is continuously working on improving existing integrations as well as adding new ones. Pros: This software happens is highly configurable in the PPM market. You can clearly see in the UI. Trying to meet the needs of my company for workflows and custom fields in supporting unique processes is the biggest selling aspect of this software. I find their customer support and training to be almost unprecedented. The staff are very much involved in the things they do. Cons: Even though the V6 has plenty of customization options for its user interface, I feel the software can do a far better job in striking a balance when it comes to offering workflow options and a pre-configured UI. This is especially for those who don't require such high level of customization. Pros: The software is super easy. Most users were already up and running in mere minutes. It only took a few minutes to figure everything out with basic training. Its robust social media module contains in-context discussions for every project. It even goes as far as each task level. Cons: One area that I think that this software needs to improve on is their reporting functionality. While most basic reporting is comprehensive, we're still in need of complex reports that couldn't be achieved via the reporting tool. With that in mind, it's very simple to export data directly from the system. The ideal software for project management. If you need more information about Clarizen or you simply have a question let us know what you need and we’ll forward your request directly to the vendor.